Cyril ran two cars during busy periods of dribving instruction with an additional tutor. Cyril on his 1926 BSA mororcycle with his wife Elfrida looking out of the doorway behind the car. 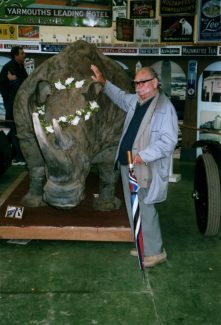 Cyril with the rhino at Sir William McAlpines. Note the additional handle to the unbrella affixed with jubilee clips to enable him to use it as a walking stick. Cyril was very proud of this. The year 2013 saw the demise of one of Billericay’s best known and regarded characters. Cyril Giachardi came to Billericay with his parents in 1938 and (when not involved in the war) commuted to London and Chelmsford for employment until in 1956 he started his Billericay School of Motoring. 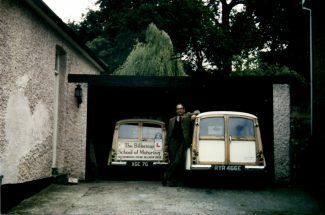 He purchased a Morris Minor Traveller for the purpose, a car which would eventually travel over 700,000 miles in ten years, albeit with the occasional new engine or gearbox. The model became iconic. Cyril would have three more of them before he retired, the last of which achieved 350,000 miles on one engine. It has been estimated that he covered one and a half million miles driving to and from the Brentwood Test Centre. A fifth Traveller, a professionally rebuilt one, was bought for his retirement. He drove that car to the High Street and back home on the day he died aged 93. For fifty seven years his white Travellers, with the driving school board across the back, were a familiar sight in the town. Fittingly, the family wreath depicted a white Minor traveller, as does his tombstone. The Army requested the pleasure of his company during the war years, deploying him in Burma. Upon his return his plane went into a rapid and steep descent, resulting in a perforated eardrum for Cyril, thus giving cause for complaint about inefficient or malfunctioning hearing-aids for ever after. 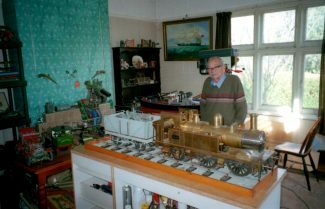 Cyril’s hobbies were many and varied: an erstwhile church chorister, a member of The Billericay Operatic Society, a founder member of The Billericay Motor Club are a few random examples, though his main interests undoubtedly lay in model-making and collecting, restoring and riding vintage motor–cycles. I use the word vintage in the old sense; to mean machines pre 1930. Today the word is used to denote English marques of the 1950/60s era, before the invasion of Japanese machinery. He became treasurer of The Vintage Motor Cycle Club. His modelling expertise enabled him to restore the extensive museum storage damage to Harry Richman’s model of the High Street. At the age of eighty Cyril decided he was too old for motorcycling, and with his family disinterested, he began the gradual sale of the collection, as and when opportunity presented. On the basis that four wheels were safer , he then acquired a 1920’s Bull-nosed Morris Cowley. A car which was good for the liver if not the spine. I write from experience. He enjoyed that vehicle for a decade, selling it when he was ninety. His interest in old vehicles took him each year, from inception in 1968, to the famous autojumble at Beaulieu. That event got bigger and more tiring every year, during which period Cyril’s legs got progressively older. In 2011 at the age of 91 and then only able to cover a limited number of stalls he decided that that would be his last visit, after some forty five years of regular attendance. Following the inevitable decline in his vintage vehicle activities he spent more time on his models. He worked in all mediums: in cardboard (vide the High Street model restoration), Meccano, wood (boats) and metal (live steam vehicles) and across the price range; some of the expensive kits running into four figure sums. I would sit and watch him at work from time to time, all the while marvelling at eighty five year old eyes inserting hundreds of tiny rivets into a locomotive. With good eyesight they may be seen in the illustration. Cyril was my first Billericay acquaintance when I came to the town in 1963;half a century ago. He remained a friend thereafter. He was an affable soul: in fifty years I never heard him raise his voice and cannot imagine him ever having an enemy. I would, from time to time meet up with him in The Chequers, where one night each week he would join with others to form an impromptu club in the small central private bar, always along with his current Cairn Terrier. One of those Cairns would occasionally go on its own! I shared with Cyril a love of “a pint of bitter with a handle” and a whisky chaser. Those Chequers nights ended when the brewers knocked through into the adjacent bars so that the erstwhile Private Bar was no longer very private! That signalled a move to the back bar of The White Hart for a spell. Inevitably his advancing years meant that he outlived many of the company. Thus he became in due course something of a fixture at The Constitutional Club, calling in most evenings for his beer and whisky and most lunchtimes for his meals. It was there in the evenings that he unconsciously developed what might be called his catchphrase. If in conversation at the bar, a name was mentioned, then Cyril would volunteer that “I taught him to drive, you know” Else it would be the man’s wife, daughter, great aunt or fifth cousin thrice removed whom he taught. Yes I did invent those last two, but you get my gist. It sounded as if he taught every family in town to drive and there was a certain degree of truth in that. When Cyril abandoned secure employment and started his school in 1956, he took a risk The town was then very small and could count its electoral votes quicker than anywhere else in the country. At that time working men, whether blue or white collared, could not afford motoring. Those two facts restricted the market somewhat. However from about 1956 there followed half a century or more of non-stop house building in the town and thus non stop residents arriving to fill them. 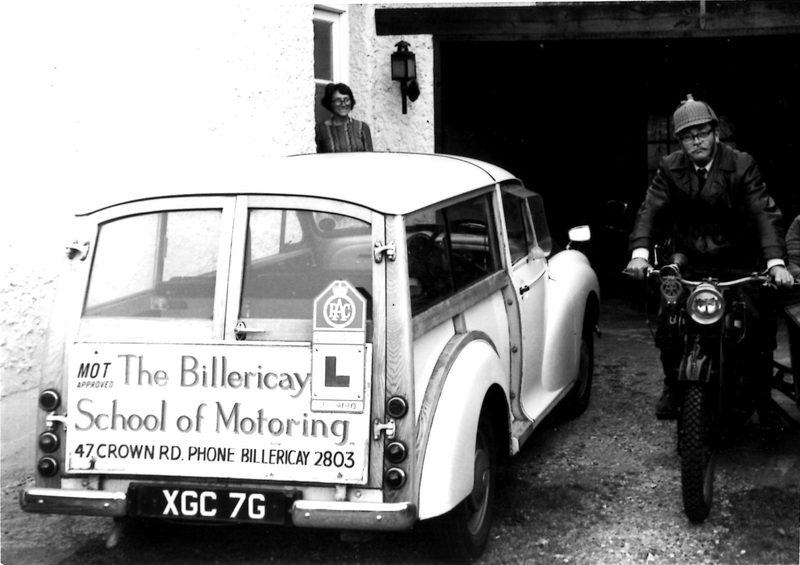 Then suddenly in the late 1960s and early 70s motoring suddenly became affordable to the masses and Cyril was on hand to teach them all!! In old age Cyril only drove in the immediate neighbourhood, but was always keen to accompany me if I had a journey to make or a few spare hours for a drive. Some of those outings would be fairly local, a pub lunch at The Viper at Highwood or The Mole Trap on Tawney Common perhaps but others would reach further. Woburn was the venue one day and on one memorable occasion I had an invitation to visit Sir William McAlpine’s private steam railway and advertising museum near Henley on Thames, which is never open to the public. His wife Elfrieda (Elfie) pre deceased him. She came from Austria after the war and worked as a nurse at St Andrews. Cyril nursed her through many years of ill health. Cyril is survived by their two children and four grandchildren. Mr Giachardi taught my mother to drive in the late 50’s and my two older sisters and myself in the early 80’s. He was such a fabulous character and possibly the most calming influence any new driver could want. I remember during one of my last lessons with him in 1985 he allowed me a “free drive” round Brentwood – to go where I wanted! As I drove up Ongar Road towards the High Street, I came towards a mini roundabout and spotting a small gap in the oncoming traffic, I gunned the engine and roared across the road into the side turning. Mr G said nothing, but when I looked across at him he was looking at me with eyebrows raised. He coughed quietly and then slowly and deliberately crossed himself. Cracked me up. Cyril taught both my Father and also my mother to drive and then it was my turn in 1972. Many hours and three failed tests later my future wife had enough! and we decided the money had to be saved for the house deposit. I am sure most of his pupils first faltering steps at the wheel were along the concrete road that runs along the base of the dam at Hanningfield Reservoir. Again most lessons, regardless of your degree of proficiency, consisted of Cyril driving you to the start of your lesson at the point on the London Road opposite the Billericay sign where Perry Street emerges where he allowed you to change seats and proceed to Brentwood and Shenfield, allowing you to drive yourself home at the end of the lesson. I have a fond affection both for the man with his kind patient ways and the Morris Traveller. David thank you writing and reminding me. I did not know Cyril had a penchant for model making and regret I never had the opportunity to discuss this subject with him or meet up for a Jar as I moved away from Billericay in 1975. Thank you, David, for a warm, kind and touching tribute to your old friend, my Dad. I was so interested to read this article as I have spent many years walking up and down Crown Road. I didn’t realise what an important part of history Cyrill was. What a lovely tribute to a truly lovely man. Cyril was my dad and not a day goes by that I don’t think of him and miss him. A true Billericay legend. As a child in the early seventies, we used to visit friends who lived next door to Cyril in Crown Road. One day Cyril called round and asked if we would like to see his collection of vintage motor cycles. It was a long time ago, so my memory is probably coloured by childhood impressions, but there seemed to me to be dozens and dozens of Motorbikes in his garage, and I was completly amazed. By the way, he taught my brother to drive, but alas not me, as I took lessons during my work lunchbreaks in Southend.